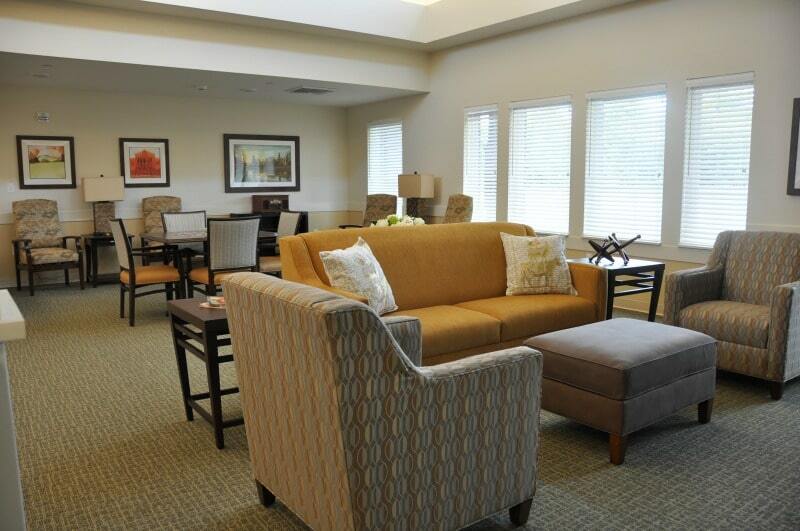 As senior living interior design experts, we know that safety is of utmost importance in memory care communities. We understand that safety considerations should not only be built into the architecture of the building, but also the overall design and décor. Many memory care communities are unaware of how interior design can affect the safety of residents, which is why we have provided these recommendations to help you identify and avoid any potential risks. Here’s how to ensure your interior design is safe for the seniors of your memory care community. Notice if you have any flooring that is shiny in appearance, slippery, or covered by a rug. All of these flooring options are hazards in senior living and memory care communities. While shiny floors aren’t necessarily slick, they can appear as such. This perception can cause anxiety and nervousness to many seniors, which can in turn cause falls. Naturally, any flooring that is, in fact, slippery should be replaced with a matte hard surface, and rugs should be removed as they can cause trips. While working with an interior design team, be sure that new designs include flooring with non-slick hard surfaces or carpet. Does your design incorporate enough lighting throughout all rooms and walkways? There should be no poorly lit or darker areas that can make it harder for seniors to see, or for memory care residents to become confused as to where they are. Do an audit of your community by sweeping through each room and walkway during the day and night time to see how the light appears differently throughout the day in each area. Interior designers can provide recommendations on lighting features such as in-ceiling, hanging lighting, and appropriate lamp types. Furniture layout is different in senior living and memory care communities than in other residential or commercial locations. While many memory care residents may be ambulatory, furniture layout and hallways will need to allow proper space those who are non-ambulatory and require assistance from staff or walkers to be able to move safely. Stable furniture is important in any senior living community. But those with memory impairments may be more easily confused or agitated than others, which may cause unexpected movements or reactions that become more dangerous with unsteady items around them. Designing for wandering walkways within memory care communities allows seniors with Alzheimer’s or dementia the ability to safely wander around. Work with an interior design team to develop a safe, comfortable “flow” that the residents can walk around and staff can monitor. Contact us if you have questions about the safety of your memory care community. Warner Design Associates has been partnering with memory care communities for more than 20 years and are experts in providing safe, functional and appealing interior design for the specific needs and desires of these groups.